Industrials titans Ministry supposedly called it quits following a farewell tour in 2008, but they returned just a few years later with Relapse. Now, band leader Al Jourgensen has announced that the group will be breaking up once again, but not before they release a swan song LP: From Beer to Eternity. While still without a firm due date, the album is reportedly schedule for a September release. Ministry worked on 18 riffs over 19 days in December, with Jourgensen joined by collaborators Mike Scaccia (guitar), Sin Quirin (guitar), Tony Campos (bass) and Aaron Rossi (drums). Tragically, this was shortly before longtime Ministry member Scaccia's unexpected passing. "This was one of the most creative Ministry tracking sessions ever. The band was on fire!" Jourgensen told Noisey. "We were having fun, we were coming up with great ideas and experimenting with everything we've ever wanted to do, from Stones-y blues to dub and, of course, heavy guitar-based rock. It was too easy. No fighting, no problems. Nothing goes that well without the floor eventually falling out." 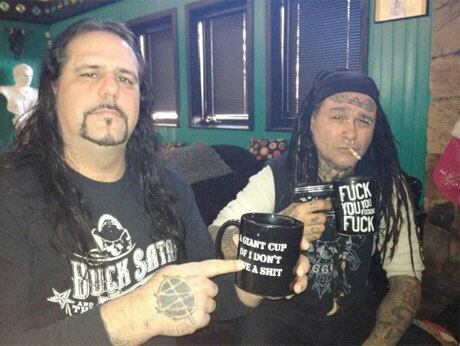 Following Scaccia's death, Jourgensen set about finishing the December sessions with co-producer Sammy D'Ambruoso. "I locked myself in my studio and turned the songs we had recorded into the best and last Ministry record anyone will ever hear. I can't do it without Mikey and I don't want to. So yes, this will be Ministry's last album," he said. Ministry don't plan to tour, but they may play a one-off show. Jourgensen will promote the album in the press, and will release an authorized biography called Ministry: The Lost Gospels According to Al Jourgensen on July 9 via Da Capo Press. See the tracklist below, and scroll past that to watch a making-of documentary about From Beer to Eternity. It features clips of the song "Thanx but No Thanx."